Are you interested in Classical History or just looking for a City Break in an exciting destination. Rome and Naples remain popular choices and this is a great opportunity to visit these destinations before the weather becomes too warm. May is also a popular time so with these prices it's a good time to book before places and flights are limited and prices increase. In Rome, classical ruins and early Christian places of worship stand next to – or lie beneath – Renaissance palazzos and Baroque fountains. But there are also great neighbourhood trattorias, quirky shops and a buzzing aperitivo scene. The challenge is deciding what not to do: there are so many churches, archaeological sites, piazzas and paintings to see that a lifetime is hardly enough. Don’t try to cram too much in: Rome moves at a slower pace than many northern cities, and to enjoy it you should take time out in pavement cafés as well as shuffle round the Sistine Chapel. There are the most well known and obvious sites to visit such as the Colosseum and the Vatican but there are also many less-well-known sites. 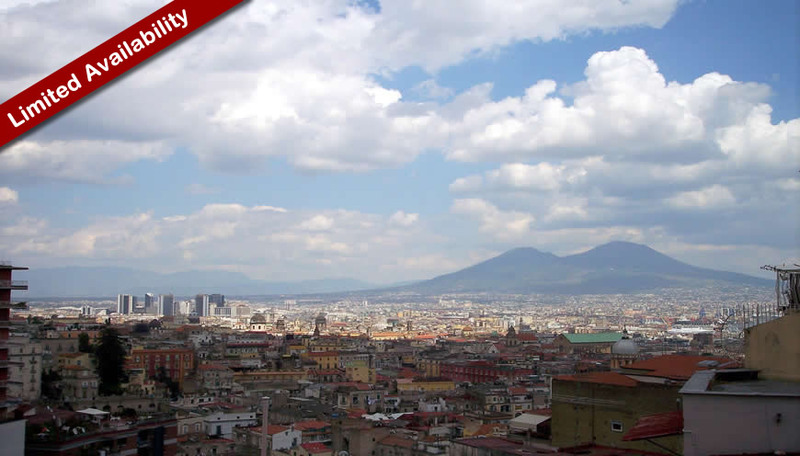 Naples is drenched in history, from the Bronze Age to its time as a settlement of the Roman Empire and beyond. The city is littered with plazas, parks, churches and even several castles like the Castel Nuovo or the block-like Castel dell'Ovo. The city's Roman roots are on display at the Museo Archeologico Nazionale, which houses the world's largest collection of Roman artefacts. Stepping onto the Piazza Plebiscito brings you back to the days of antiquity while the church San Francesco di Paola invites you inside to marvel at its statues and architecture. Enter the Historic Old Town and see locals going about their daily business, and stroll the Spaccanapoli and stop into a pasticceria for a sweet pastry or any of the hundreds of cafés for a cappuccino. Finish the day with a real pizza made according to traditional methods in the birthplace of the dish itself. The ill-fated settlements of Pompeii and Herculaneum are just an hour's trip away by train. Mount Vesuvius can be hiked from Pompeii in a day and provides amazing views over the entire Naples area. The three beautiful islands of Ischia, Capri and Procida are great for day trips direct from Naples on a quick ferry. The charming small town of Sorrento, just to the south, is a good place to relax away from the energy and intensity of Naples. Imagine independent travel, without limits, on your terms, with full professional support at affordable prices. Imagine having your own travel consultant who will work with you and for you on a personal level with a wealth of expertise and knowledge. Well, imagine no more – the time is now! Orbis Travel guarantees an affordable, first class, personal service. Don’t risk disappointment – have the full back-up and guarantee of an ATOL bonded travel company. We always try to take that extra step to ensure that your holiday is the best it could possibly be. It is our aim to secure you as a regular client and we feel that once you have travelled with us and experienced our high standard of service, you won't want to risk travelling with any other company. We offer true personal attention and it is our pleasure to build a strong relationship with our clients as we work with them time and time again over the years. We are pleased and proud to receive wonderful comments from our clients and are delighted to share some of these with you here: Customer Comments. Please use the Email Enquiry or the Contact Form below to get in touch. We'll respond to you as soon as possible. We are always happy to help. Our team is available by phone, email and online chat. Emails are regularly checked outside of office hours. With good reviews and centrally located. We negotiate the best possible rates with hotels and offer a price-match guarantee. Full support throughout the booking process and whilst you're away. Please see our About Us page. Looking for inspiration? See our latest Featured Destination here. Find out all the latest News, Travel Tips and Best Places to Visit. Whether you are looking for local travel or to span the globe, we are able to assist with all your travel and holiday arrangements. We also have a range of suggested itineraries and packages for you to choose from - or even use these as a starting point from which we will assist you in developing your own itinerary.